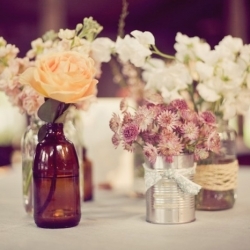 Have you been wondering what type of centerpiece might look best at your wedding? Your wedding’s centerpiece can make a huge impact on your guests so we encourage that you add as much of your own personality in the look and feel of your centerpiece as possible. That includes showing the right wedding flower type, flower color and wedding flower arrangement. There are many different centerpiece options that you can choose from. 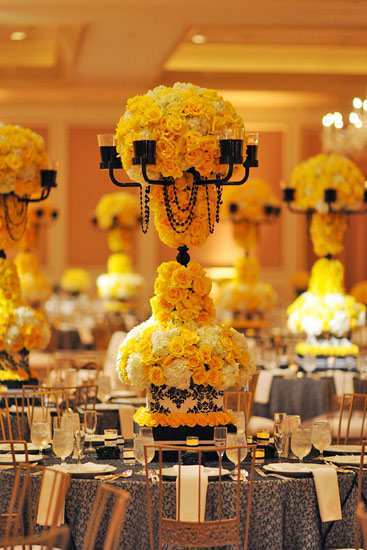 By highlighting some of the most popular centerpieces for 2013, we hope to make that decision a bit easier for you. The fairytale flowers: These beautiful flowers are large and elaborate, fit for a royal wedding. It goes very well with a bride’s wedding bouquet that has lots of bright colors as well. Dramatic and elegant: These still quite large bouquets do make a statement while adding a very classic look to your wedding table and wedding centerpiece. Whimsical and original: If you like to stand out from the norm you do not need to use the traditional wedding flowers in your centerpiece. 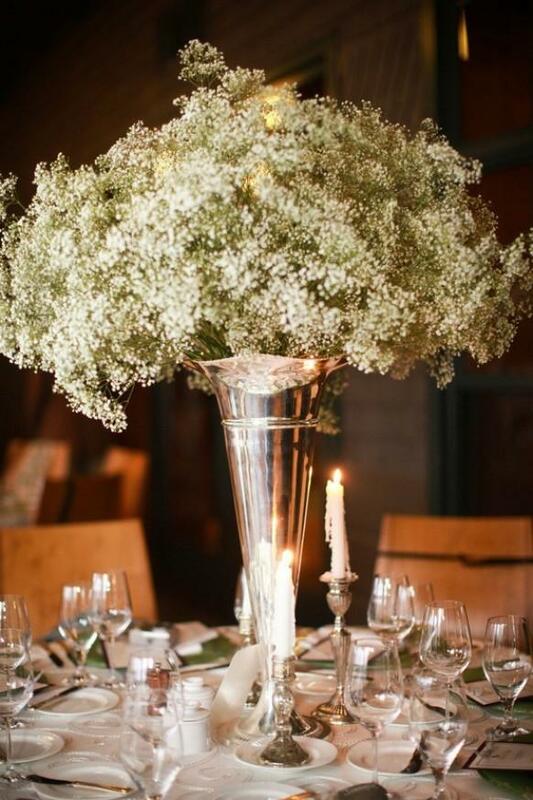 Baby’s breath is definitely a theme this year. This centerpiece is beautiful and soft like a fluffy cloud over your table. Fruits as your centerpiece: Do you love strawberries? They are beautiful simple flower and fruit that adds a whimsical look to your centerpiece. Yummm! You might even catch some of you guests grabbing a bite before dinner. For more details and centerpiece options click here. Some of the first wedding flowers that brides and event planners think of for their wedding tend to include traditional flowers such as roses, hydrangeas, and calla lilies. This article highlights some less expected yet very popular wedding flowers amongst brides today. Fuji Spider Mums: Although its name may be scary to some, the Fuji Spider Mum flower is a beautiful flower to add texture to any wedding bouquet or centerpiece, especially in a white flower themed wedding, or if only one color is used throughout all the flowers. Fuji Spider Mums come in various colors such as lavender, white, yellow, and bronze. Cymbidium Orchids: The cymbidium orchid is a tropical flower with a fairly large bloom with thick waxy petals. This flower and its durable appearing petals come in various colors such as white, green, yellow and pink and the blooms display different shades at different parts of the flower. The inner most petal forms a lip shape and often show off vibrant colors. The gorgeous color combinations of these flowers make them a brilliant flower to add to your wedding bouquets or centerpieces. Iris: The Iris is named after the Greek Goddess of the rainbow. It has a bright blue/purple bloom which opens to reveal a splash of yellow that contrast perfectly with the petals. This flower can mesmerize eyes in your floral arrangements and bridal bouquet especially for a bride with a blue and yellow color scheme on her wedding day. The iris can also be very well complemented with other flowers such as roses or hydrangeas of various colours. To make the iris stand out a lot of brides choose subtle blue and white toned colour flowers in the rest of their flower arrangements. For more details on different bulk flowers and bridal flowers with unique and traditional wedding flowers visit BunchesDirect.